“Good things must share” and nothing encapsulates this better than buffets. Conquering them solo only unlocks a Pandora’s box of heartburn and heartache, as you struggle to finish the endless food. Bring along a Player Two, however, and you’ll be able to split the calories – and costs if you’re a Maybank Cardmember. Check out these hotel buffets with 1-for-1 deals and up to 50% discounts for you and your bestie. You can come to Caprilicious’ lunch buffet ($32.80++) every weekday and still find something new to pamper your taste buds with. After all, the buffet changes themes daily, which means more grub for your tum-tum. 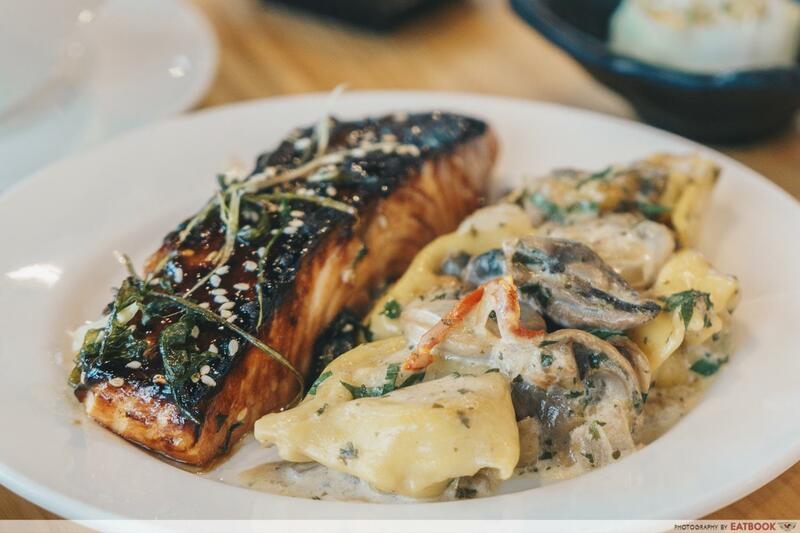 We headed down for their Tuesday Asian Delights session and were wowed by their Teriyaki Salmon Fillet and Creamy Truffle Infused Mushroom Pasta, both of which boasted strong flavours and scrummy sauces. Other standouts include their Stir Fried Spicy Prawn Pad Thai and Braised Beef Brisket. To sweeten the deal, Maybank Cardmembers get 20% off their total bill from now till 31st December 2019. 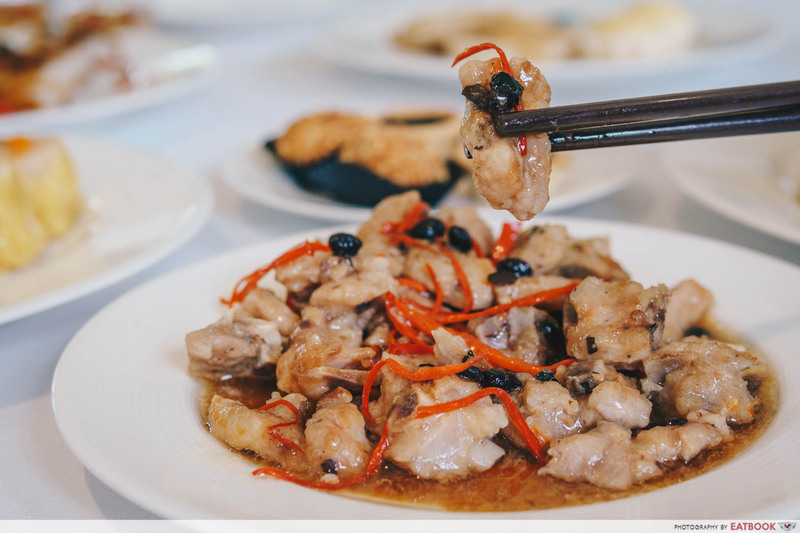 Stepping into Ellenborough Market Café feels like you’ve walked onto the set of The Little Nyonya, with baby blue walls and lattice fixtures filling the place. 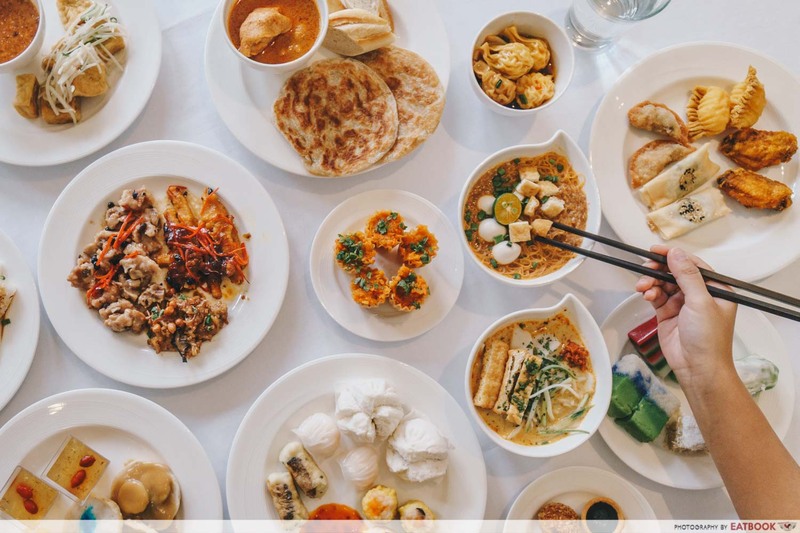 As such, you can expect lunch ($52++) and dinner ($68++) buffet menus that feature a medley of Peranakan, local and international flavours such as Kueh Pie Tee, Ayam Buah Keluak, Babi Pongteh and Durian Pengat. Seafood lovers will also love their wide selection of fresh and plump seafood including prawns, baby lobsters, mussels and whelk. 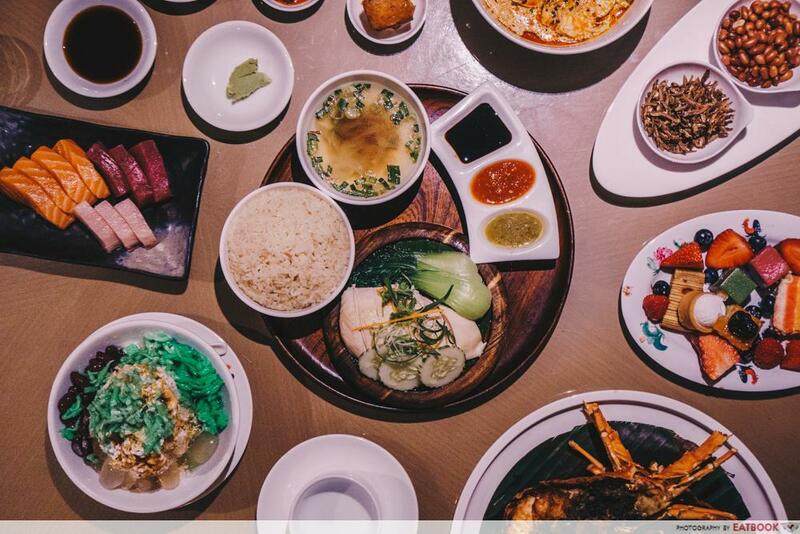 Maybank Cardmembers should jio a friend along, as the restaurant has a 1-for-1 on the lunch and dinner buffets. 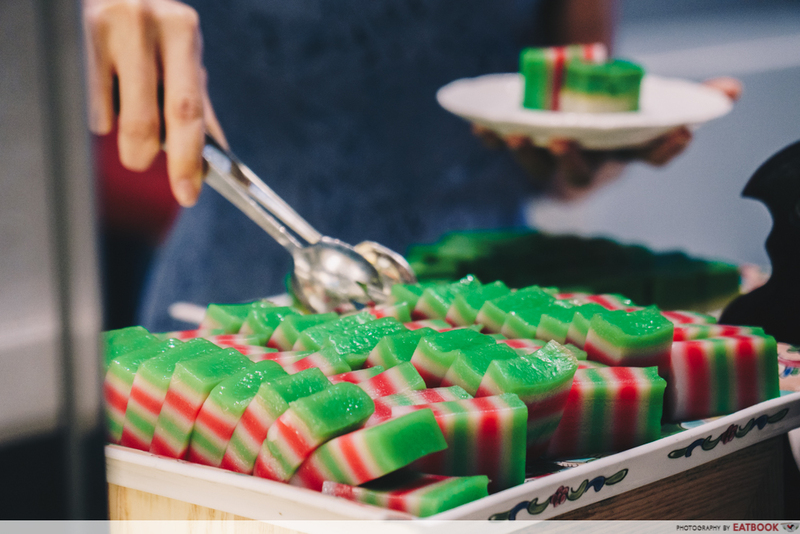 That means you can get your Peranakan fix from just $26++ per person! 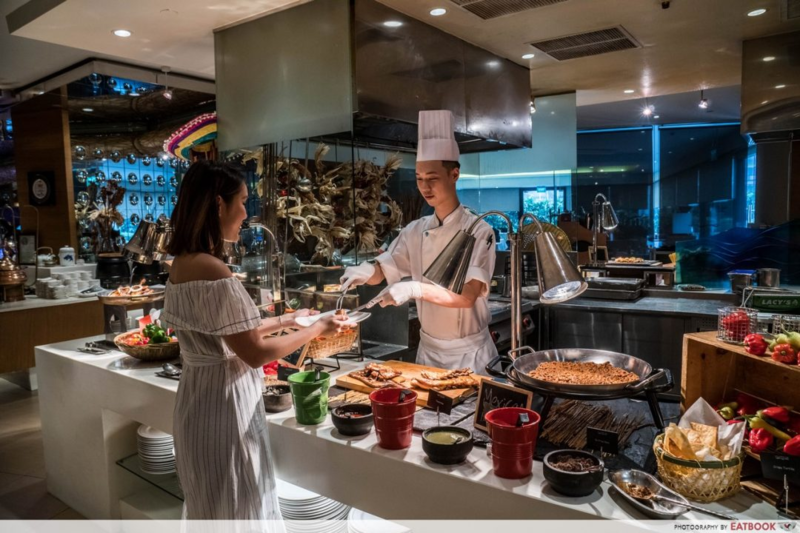 With a swanky interior adorned with luxe leather seats, and an extensive menu of Asian and international delights, it’s no wonder most people go to Town Restaurant’s Brimming Buffet Dinner ($59++ on Sun-Thur, $85++ on Fri-Sat). Take your pick from the likes of roasted lamb leg, roasted duck, and sashimi! 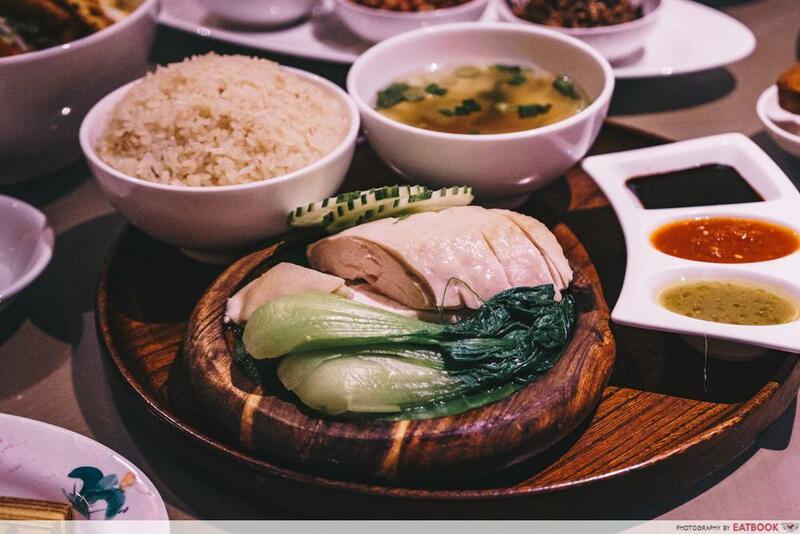 Be sure to also try their signature Hainanese chicken rice, which comes with fragrant rice and thick chunks of steamed chicken. If you’re a Maybank Cardmember, you might wanna gather a squad before heading over as one person dines free with every three paying customers! The offer ends on 30 September 2019 and is subject to blackout days, so be sure to make a reservation beforehand. 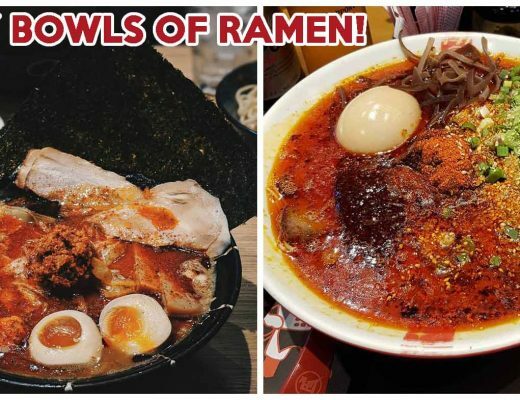 If you have a liking for all things Nippon, Kuishin Bo’s lunch (from $36.90++) and dinner buffets (from $54.90++) will satisfy your Japanese food cravings. 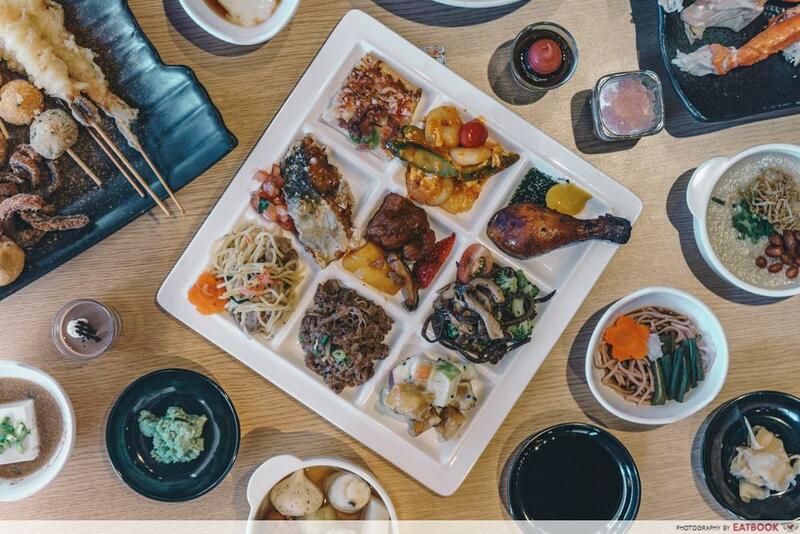 From now till 3 June 2019, check out their Ohanami Fair which features 15 sakura-inspired dishes on top of 150 evergreen favourites across ten sections – great for those who wanna celebrate the cherry blossom season without flying to Japan. Here, you’ve got good ol’ favs like seafood, teppanyaki, katsu and paper hot pot. 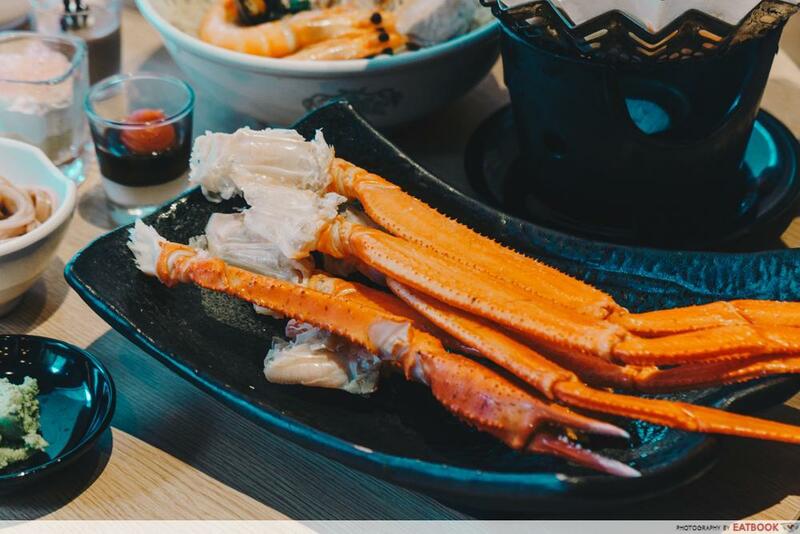 During dinner hours, be sure to pile on the free flow Zuwaigani (snow crabs) which are humongous and packed with lots of meat. Keep an ear out for their iconic “dong, dong, dong” bell, which alerts guests to hourly specials of limited quantities, such as Japanese desserts, lobster and more. End your makan sesh with delightful desserts such as kakigori (shaved ice), matcha mochi and rainbow cheesecakes. Maybank Cardmembers will wanna come in groups of four as one dines free with every three paying adults. 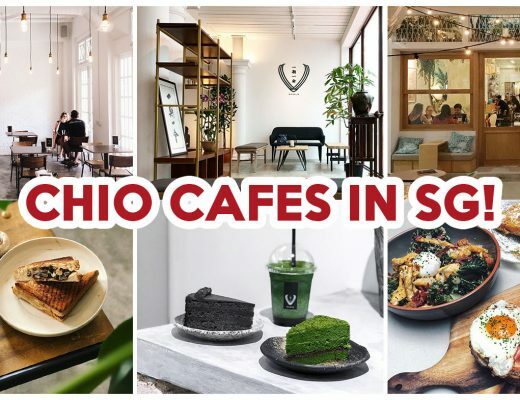 Unlike the Ohanami Fair, this deal is valid till 30 September 2019 between Monday and Thursday. 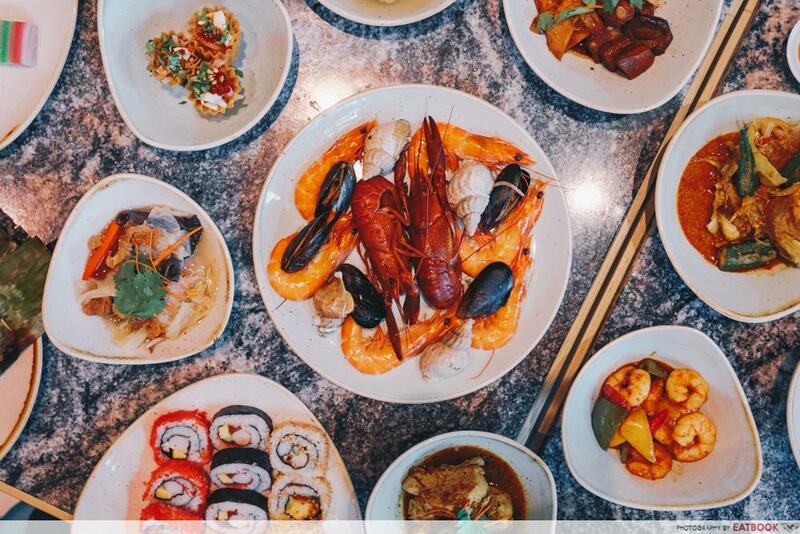 For those who attack the seafood section first, Atrium Restaurant’s Surf N’ Turf Buffet Dinner ($88++ on Sun-Thur, $98++ on Fri-Sat) will be right up their alley. 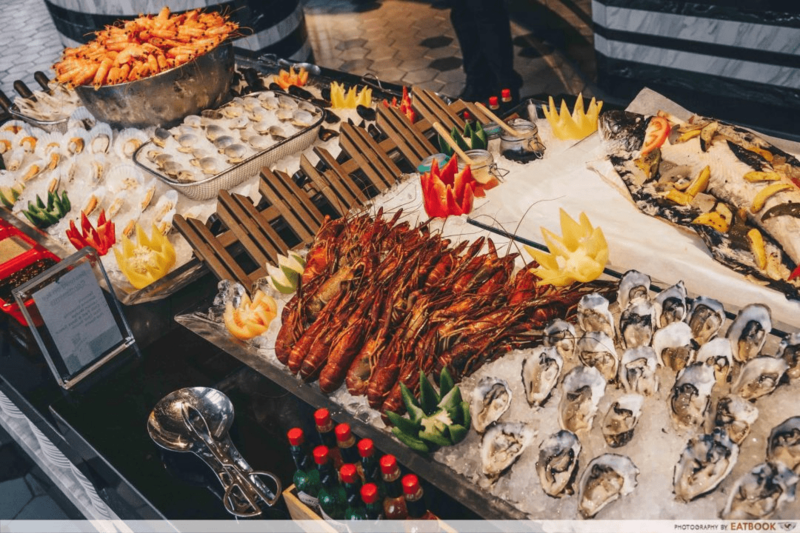 Available till 30th April 2019, this buffet is well-worth its price tag, thanks to the selection of luxe seafood like French oysters and baby lobsters. Come on weekends for free-flow Boston lobsters! If you require some protein, there’s also a jumbo tomahawk steak that’s basted with red wine sauce. Maybank Cardmembers are in for a treat, as they get 1-for-1 lunch and dinner buffets at Atrium Restaurant. If your appetite isn’t huge, fret not as there’s also a 15% off on their à la carte menu. Muslim peeps, don’t despair ‘cause AquaMarine’s got your back with their impressive Weekday Buffet Lunch ($60++)! Almost every cuisine is represented here, and you can savour items such as seafood, sashimi, pasta, and curries. For dessert, check out their kueh corner and, bread and butter pudding for toothsome treats. Maybank Cardmembers get to enjoy the Weekday Buffet Lunch at only $50 nett. This is a steal, given the buffet’s enormous range of dishes and the hotel’s prime location. Azur Restaurant is easily one of the crown jewels of Crowne Plaza Changi Airport, thanks to their unique spin on international dishes. 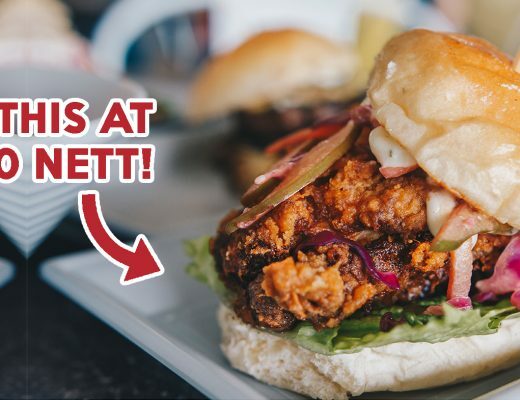 Their lunch ($58++) and dinner ($68++) buffets comprise an array of fresh seafood on ice, international favourites and other tantalising treats like Caprese Stuffed Portobello, Pesto Orecchiette and Matcha Ice-Cream. 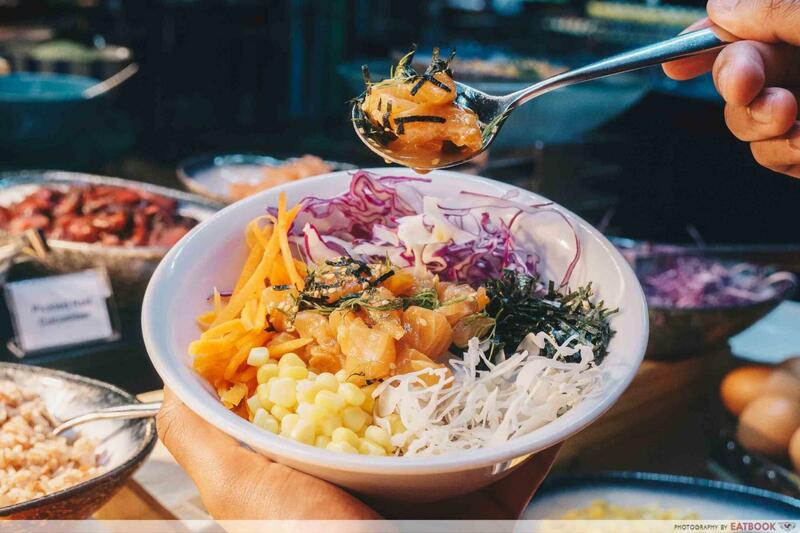 What sets them apart from other buffets is their poke bowl station, which has ingredients such as seaweed, teriyaki chicken and quinoa. In particular, the salmon sashimi deserves high praise for its freshness and flavour. From now till 30th September 2019, settle the bill with your Maybank Card, as one dines free for every three paying adults. Just be sure to make a reservation beforehand! 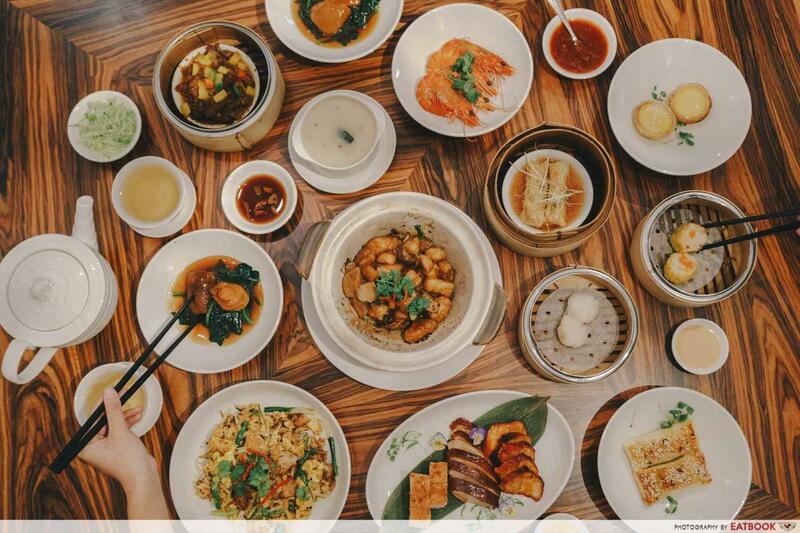 Feel like a tai tai when you indulge in Man Fu Yuan’s Weekend Dim Sum Buffet Brunch ($58++). The à la carte buffet requires a minimum of two to dine, and features a menu teeming with 40 scrumptious dishes. Don’t just fill up on their dim sum; order the mains to share too, including cod with garlic and mushrooms. 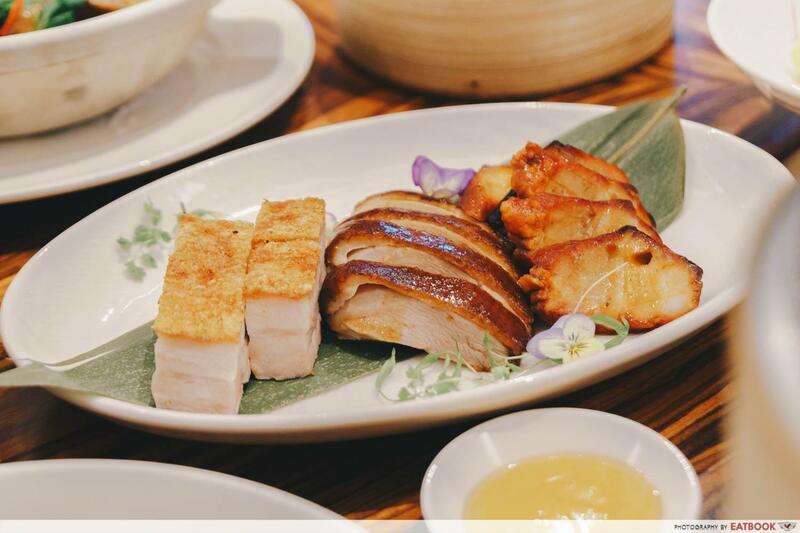 Their roast platter is also a must-get and features a treacly honey-glazed barbecued pork char siew. From now until 30 September 2019, cinch 20% off your total bill when you pay with your Maybank Credit or Debit card. All you gotta do is quote “Maybank” when making reservations. 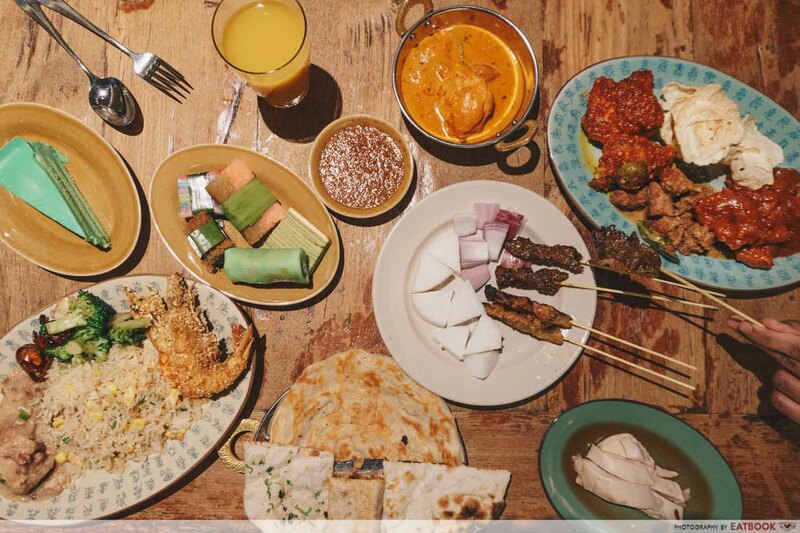 Once Ramadan hits on 6th May 2019, Straits Kitchen will be joining in the festivities with their menu of classic Asian dishes like beef rendang, carrot cake, satay, chilli crab and naan. The satay is cooked on the spot which lends to its robust flavour and tenderness. 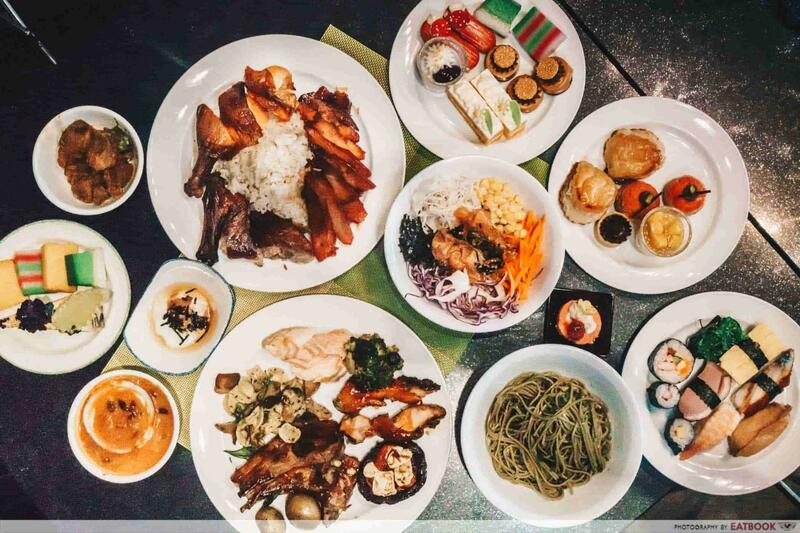 Maybank Cardmembers can score 25% off their lunch buffet* ($58++), so they won’t need to bust the bank. Do note that you’ll need a minimum of three people in your dining party and a maximum of 10 diners to enjoy this deal. *Available from 6th May 2019. 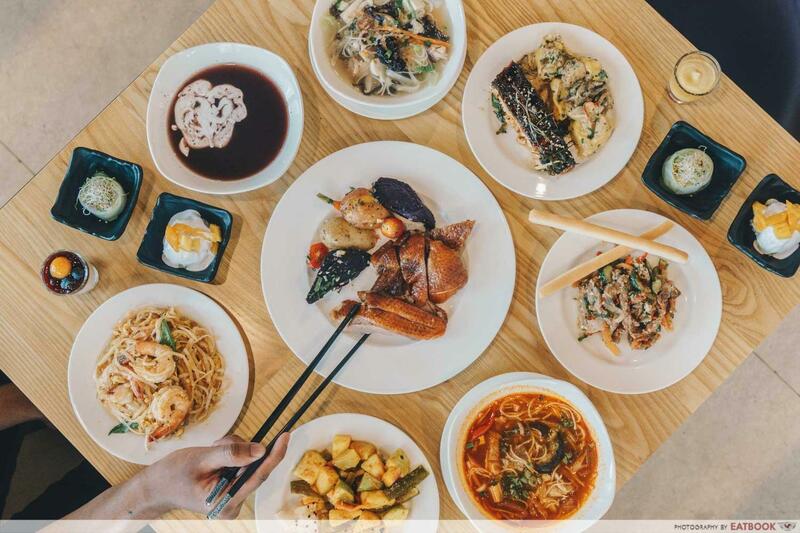 While you’re busy sampling the goods at Goodwood Park Durian Fiesta, be sure to make a pit stop at their Weekend Makan Affair ($39++ per adult, $19.50++ per child). 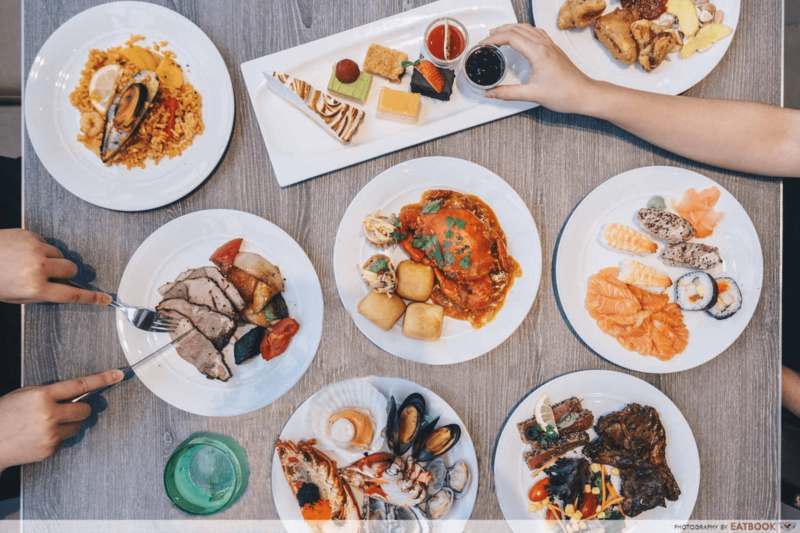 This high tea buffet consists of bottomless rounds of 20 local dishes including kueh pie tee, dim sum, and chicken curry with baguette. The tender pork ribs, in particular, were doused in black bean sauce that gave the meat an umami kick. Be sure to drag your BFF down with your Maybank Credit or Debit Card, as one dines free for every three paying guests. Besides being an occasion to treat yourself to a slew of tasty grub, buffets are also a great way to spend quality time with the people you love. Be the MVP of your makan group and apply for a Maybank Credit or Debit Card to reap the benefits of these stellar dining deals. Apply now and get an attractive gift today**. 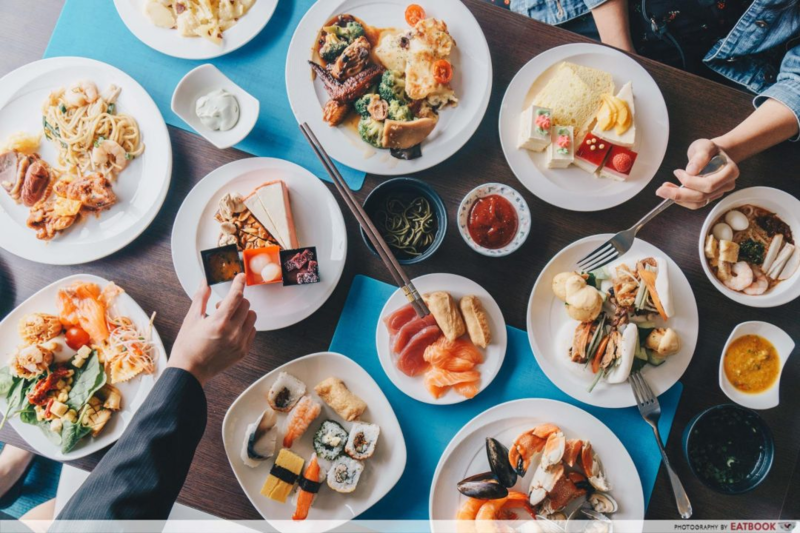 If you’re inspired to go on a buffet crawl, then signing up for the Maybank Horizon Visa Signature Card will be a great choice, as it gives you 3.2 air miles (8X TREATS Points) for every dollar spent on dining transactions^. Photos taken by Lim An, Huy Pham, Rae Fung, Koh Huiqing.